Following the itinerary given by Paul Holt, we arrived at 730am at the bottom of Erla Shan pass（鄂拉山) after a tedious 3 hour drive from GongHe. I was very much driven by the thought of the birds that I will see at the summit which is at 4800m! It was good to start early as the mild wind and cluttered clouds made the walk enjoyable; with every step I took, I could hear my heart thumping hard. There is no trail to follow, but I found my way up stepping on stones, gravel and giving myself a little goal ,which big stone to stop and catch my breath. It took me 1.5 hrs to get to the summit- though the base of Erla Shan was 4400m and only 400m to climb up the summit, it wasnt easy at all! But I was rewarded with the magnificent views of the mountains surrounding Erla Shan. And as I catch my breath, very soon one of the star birds came close- Tibetan Rosefinch, 藏雀! The weather at the summit changed dramatically- from sunny, it became misty and we were careful not to fall off the mountain as the visibility was very low. I wanted very much to see the Tibetan Sandgrouse but couldnt find them. Nonetheless, I saw other birds including the Plain Mountain Finch (林岭雀), Tibetan Lark (长嘴百灵), Brandt’s Mountain Finch (高山岭雀) and some sort of Gerbil! It was a good climb and I’m glad I did it. We’re very lucky with the weather – as soon as we popped back into the car- thunder and lightning rolled in! 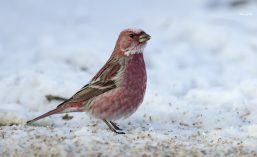 This entry was posted in China, Uncategorized and tagged brandt's mountain finch, Erla Shan, 鄂拉山, kam dwarf hamster, Paul Holt, Plain Mountain Finch, qinghai, tibetan lark, tibetan rosefinch. Bookmark the permalink.